Newry, Maine, July 16th 2011. Antoine L’Estage and co-driver Nathalie Richard capped off a bitter sweet 2011 season with a victory at New England Forest Rally, the final round of the 2011 Rally America Championship. L’Estage who ran first on the road, seemed to charge unopposed to victory over Team Subaru USA driver David Higgins. 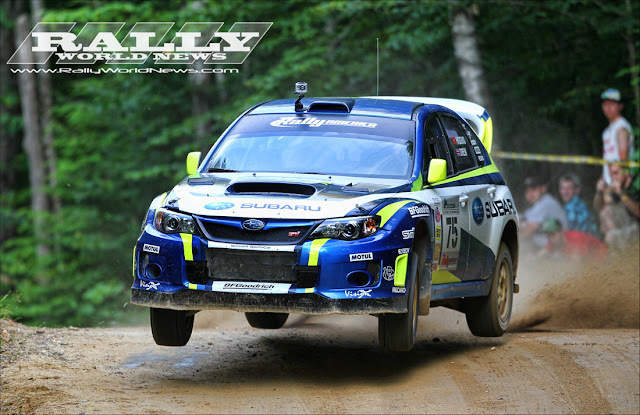 Higgins clearly drove to plan with a caution approach throughout the event to secure the 2011 Rally America Championship title for Subaru. Despite the lack of a battle off the front, the same could not be said back in 2WD, local driver/legend Chris Duplessis won over the fans in his 2011 Ford Fiesta R2 as he drove at and beyond the limit to place first in 2WD and a unbelievable 5th overall in the event. The New England Forest Rally will definitely go down as the sting in the tail of the 2011 Rally America Championship, as temperatures flutters in the upper eighties, drivers and co-drivers faced some of the toughest/rocky/dusty stages of the season. Many of the stages were still showing scares from heavy runoff after a very snowy New England winter. Throw in a few big spring storms and rally organizers were scrambling pre -event to repair the stages where they could. Maine has always been notorious for rocks; year after year the organizers have taken the time to highlight the worst of these immovable objects, but for some reason this year the trademark orange markings seemed to have quadrupled over prior years. 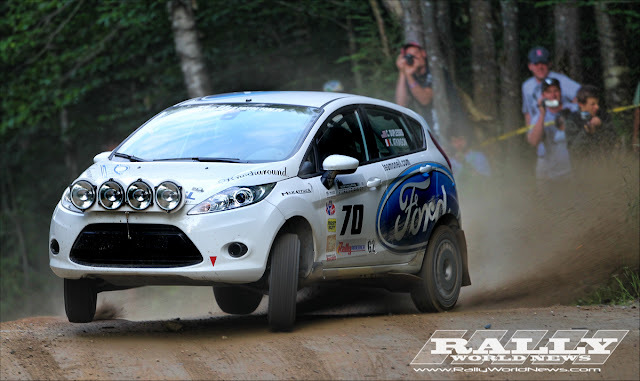 The opening stages of the NEFR event got underway with three short spectator super specials, the first ran on some of the service roads of The Sunday River resort, which was also the rally headquarters. Then after a short transit to the town of Mexico the drivers would tackle a rather steep man made jump as they completed this series of short Spectator specials SS1,2,3. With the departure of Travis Pastrana and Ken Block from the 2011 Rally America Championship and Dave Mirra been pulled from the rally in the weeks leading up to the event, one could clearly see a drop in spectator’s attendance over prior years at this very popular Rally. L’Estage would open big taking victory on the first two stages, Higgins took the third super special by a headlight bettering L’Estage by a mere four hundredths of a second. Onto the first true test of the rally, SS4 “Icicle Brook North” for the most part this is a fast flowing two car logging road with some soft crests, that is until you tackle the new section around Metallak Pond, the stage tightens to a tight technical single lane road, with a few hidden gotchas to keep drivers on their game. Running first on the road therefore sweeping the loose gravel for those in his wake, we had expected L’Estage to lose time to David Higgins over this 16 mile test. But L’Estage attacked hard and opened a 19second advantage over the Team Subaru driver through the flying finish. Again on SS5 which was a reverse of SS4, Antoine L’Estage pushed hard for his fourth stage victory on day one, adding 23 seconds to his advantage on Higgins. Heath Nunnemacher and Mike Rooney in their rented Evo 9, edged out Travis Hanson on SS5 moving Heath to third overall heading into the historic Concord Pond stage. SS6 Concord Pond, although short in length at only 5.76 miles, this may very well be one of the most popular stages in US stage rally. Ken Block and Alex Gelsomino took it upon themselves to set the record time on this stage, with their last record set in 2009. In an interview with David Higgins prior to the event, when asked would he go after Block’s time on Concord Pond, Higgins replied, “we need to focus on the Championship for Subaru, but if its right we will see what happens” I don’t recall anyone asking Antoine L’Estage regarding his intention to dethrone Block. Ken Block’s fastest time on Concord Pond was set in 2009, with a time of 4:17.9, but it’s important to note that the stage length was 5:38 miles. 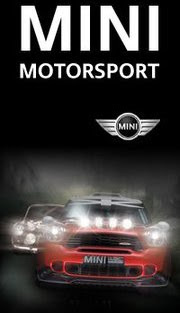 After some research post event it seems that in 2010 the stage length was changed to 5:76 miles. So in that same year Travis Pastrana effectively set the new stage record at that distance with a time of 4:23.1. This year Antoine L’Estage and co-driver Nathalie Richard smashed Pastrana’s 2010 record stopping the clocks at 4:20.7; it’s also interesting to note that L’Estage had an average speed for the stage of 79.54 mph versus Block [2009 record time at 75.1 mph], so did L’Estage actually smash Block’s time over the shorter distance, we think so. Ramana Lagemann was the closest to L’Estage in Concord pond, but was a whopping 15 seconds off the pace. David Higgins time over Concord Pond was handicapped by transmission problems, pushing him to third. Heath Nunnemacher, who had battled his way to an impressive third overall coming into Concord Pond, made an uncharacteristic mistake over the last crest on the stage and veered off the stage into the trees. By the reaction of the fans that were packed into the woods at the infamous “jump over rock” towards the end of Concord Pond, Chris Duplessis stole the show with his epic sideways over crest move. In this only his second rally in the newly developed Fiesta R2, Duplessis was already shredding the 2wd field and then some. 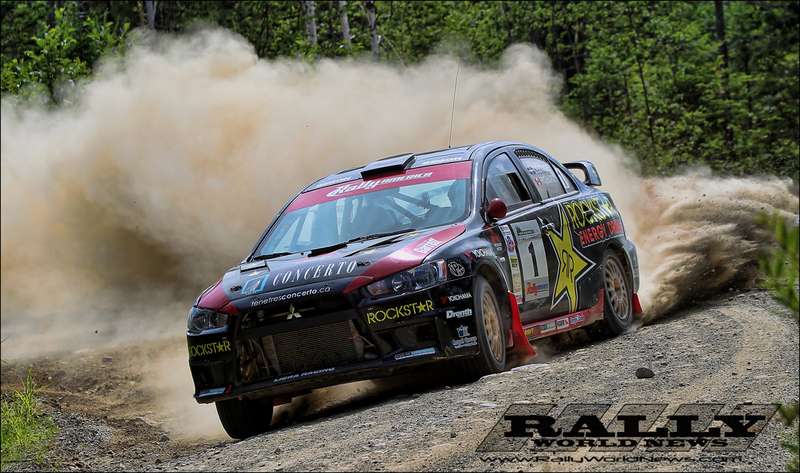 Heading into day two, with Antoine L’Estage holding a minute lead over David Higgins it was fairly obvious that neither Higgins nor Subaru were going to risk the overall Championship by trying to chase down L’Estage for the overall victory at Maine. Due to some major water damage on the Success Pond stage it was not run this year, but was replaced with a short Spectator super special in Errol NH. The balance of the rally would be fought out over four growling rocky stages, varying in length between 12 and 19 miles in length. Antoine would take stage victories on three of the final stages sealing his overall Rally victory. Higgins would claim his only “proper” stage win of the rally on SS9 while holding onto 2nd overall in the rally and claiming the 2011 Championship title. The 2011 SP Class winner Travis Hanson in his now overheating Subaru would manage to hold off a late charge by Tom Lawless to secure third overall in the rally, a perfect ending to a dream season for Travis and his co-driving father Terry. Chris Duplessis and his new co-driver for this event Karl Atkinson took their Ford Racing R2 Fiesta to the top of the 2WD podium. Chris had opened a 40 second gap on his nearest rival Andrew Comprie Picard on day one, and continued to widen the gap on day two. Andrew in his Scion Racing XD would eventually finish over three minutes behind Chris to grab second on the 2WD podium. Fellow Ford Fiesta driver Dillon Van Way rounded out the podium for Ford grabbing third. The New England Forest Rally capped off another great season for Rally America, a season where the light dimmed some with the departure of some top names, but also a year where we have seen some very exciting activity in the 2WD class. "That's the (total) distance they way the stages are laid out in a route book (from ATC->FTC), so they just didn't get adjusted/corrected when noting/transferring the actual "competition" distance. It's just something that slipped through the cracks with all the other things that needed to be done with much of the organizing committee having undergone changes since 2009".